The kids and I have been playing Pokemon GO since the weekend it came out. July 17th 2016 to be exact. We love Pokemon GO and we are always looking for ways to enjoy the game in different ways, like when the Pokemon GO Plus came out, we were right there to get them! 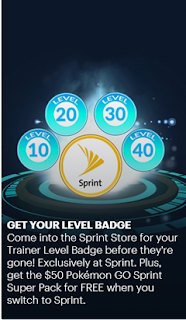 Sprint invites Pokémon GO Trainers to go Unlimited and get a $50 Pokémon GO Sprint Super Pack for FREE! The Pokémon GO Sprint Super Pack includes Ultra Balls, Lucky Eggs, Pinap Berries, Lure Modules, Incense and more… It’s perfect for the Trainer on-the-go! To take advantage of this special offer, visit a local store and switch to Sprint or add a line to your existing Sprint account. While you’re in the store, ask a Sprint representative about Sprint Unlimited Freedom. Customers can also receive moto e4 smartphones for the whole family. Up to 10 lines of the moto e4 are on us - available for new and existing Sprint customers who add a line to their account. ALSO! 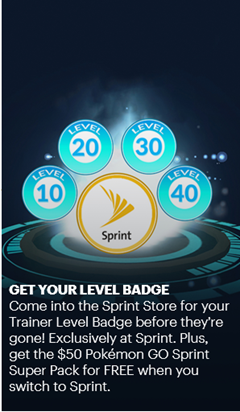 Trainer Level Badges are now available exclusively at participating Sprint stores nationwide. Trainers can pick-up their Trainer Level Badges, sign up for Trainer Rewards, recharge their batteries, and most importantly… have fun. For a limited time, when a customer switches to Sprint, they can get five lines of unlimited data, talk and text for $20.00 per month per line. Plus, for a limited time, the fifth line is free. This offer includes HD video and 10GB of mobile hotspot data per month per line, so you can play as much Pokémon GO as you like, without worry. Do You Like Retro Candy? Check These Out! 10 Gifts for the Firefly FAN in Your Life! Get a Free Trial of HBO through Amazon! Mini Emojis Toys Are HOT This year! Oral I.V. The Easy Way to Get Your Daily Water!